Happy Monday!! Happy New Year!! We’re almost half way through January and I’ve had a wonderful long relaxing break. Wow, did I ever need that! There’s always a winter slow down. I’ve got a few sessions here and there but most of my time is spent reorganizing, planning for the year and the dreaded preparation for taxes. Working with the little faces is way more fun than that so I’m offering a winter special to get out of this cave! 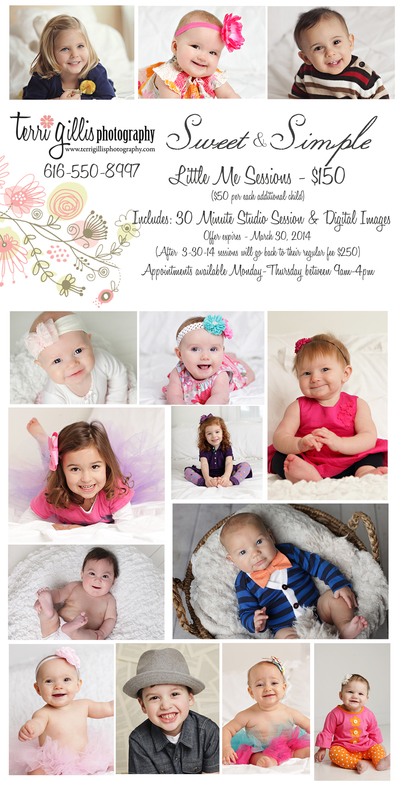 Sweet & Simple – “Little Me” – winter special – $150 (normally $250). I’ve had visions of tu-tus, neck-ties and crazy colorful clothes all on a one day mini-session but my gut kept bringing me back to …. Sweet & simple. Dress your little one however you like and let’s focus on their sweet little self. 1st child is $150 and additional children are $50 each. Limit of 2 outfits per child. Recommended ages 3mos and up. I will also have some sweet new products to show you as a way to display your photos, or give them as a gift for gradparents (or for yourself).